What's the hype about Phil Tayler's work? Phil Tayler as Alex More/et all in Buyer and Cellar. "[Phil] Tayler’s characterizations are sharply etched, he delivers Tolins’s witty one-liners with brio, and he seems to be having the time of his life as he ranges energetically across the elegant, airy set designed by Anthony R. Phelps. Impressively, Tayler’s concentration remained unbroken even when a spectator’s cellphone went off three different times, for a total of about 10 rings, during a key scene at the performance I attended." "It's a joy to watch his every facial expression, his fluid movements, that rather naughty glint in his eye, betraying how much fun he's having performing this role. But not as much as we are. It's extremely rare to experience a show that literally consists, as noted above, of non-stop laughs. It's Tayler's best role ever, and that's saying quite a lot. Attendance at this performance would be the greatest holiday present a theatregoer could give, either to herself or himself, or to others. It's a phenomenon, already the highpoint of this season." "Credit the fully formed performance of Tayler, who is instantly likable as a man who is openly dazzled by high-rent glam but refuses to discount himself. More “was never that big a Streisand queen,” he avers early on, though he did “appreciate this stuff as part of my gay birthright.” Tayler chows through chunks of text with conversational ease, presenting anecdotes (in which he voices More, as well as his new employer and his boyfriend Barry) with dinner-party drama. He fires off the playwright’s piles of quicksilver one-liners with nimble verbosity." "There is a palpable dynamic to the show that's akin to stand-up comedy in terms of the energy and the timing in Tayler's performance. He instantly and expertly forged a connection with the room that never wavered, and more than once he seemed to glow with the intensity of the tale he was telling - all of which gave the material the living electricity it needed to spark." "The talented Mr. Tayler pulls off this high-wire act with aplomb and panache [... he] launches Tolins' arrows with flawless precision, hitting a bullseye with each one." "Courtney O’Connor directs the piece with breakneck speed: Tayler turns on a dime to become a different character. It’s quite an “aspirational” feat, to borrow one of Tolins’ clever viewpoints. You’ll be wowed by Tayler’s transformations and highly amused by his chutzpah. What’s not to like?" "Tayler pulls the audience in right away, playing Alex with a self-deprecating, yet winning personality. His adeptness with the other characters is such that you forget you’re seeing a one-man show. The assistant’s manner is contained and snide. Barry, Alex’s boyfriend, is nerdy, more well-versed in gay icons than Alex. James Brolin makes a macho appearance, to check out his wife’s new employee. Tayler’s Barbra is terrific – feminine, vulnerable, lonely, yet in control. It’s a tour de force performance that Tayler manages to make look easy"
"[Phil Tayler] is utterly divine, holding us all in thrall, alone, on a beautifully appointed stage ... Tayler is a wonder. He’s stood out before in “Avenue Q,” “Sweeney Todd,” and “Stones in His Pockets,” but at last he takes center stage solo, telling straight out what is and is not real, and is immediately charismatic and in charge. Perfect comic timing and a diabolically mischievous tone distinguish his wise and wandering actor/ersatz proprietor Alex; Tayler then slips in and out of all the other characters like 'butta.'" "There’s one great reason to see Lyric Theatre of Greater Boston’s one-act, one-man, almost two-hour play, “Buyer and Cellar” - Phil Tayler. The versatile Boston actor has previously won accolades from critics and audiences, portraying vivid characters in dramatic plays, musicals, comedies, and shines even brighter at Lyric Theatre. Jonathan Tolins’ play isn’t anything special - not really. But it’s a marvelous forum for Tayler, as he transforms, without props, costume changes or other accoutrements, from narrator Alex More to Streisand and other roles." Phil Tayler as Tobias Ragg in Sweeney Todd the Musical. A particular standout is Phil Tayler, as Tobias, the good-hearted assistant to Mrs. Lovett and the conscience of “Sweeney Todd.’’ Tayler touchingly conveys Toby’s confusion and anguish (though the character’s simple-mindedness requires the proverbial suspension of disbelief, given that when we first see Toby he is racing through the intricate lyrics of “Pirelli’s Miracle Elixir,’’ complete with a reference to Shelley). When Tayler’s Toby delivers a profession of devotion to Mrs. Lovett, “Not While I’m Around,’’ it is piercing in its pure-hearted humanity. In the pitiless world of “Sweeney Todd,’’ the betrayal of Toby somehow seems the most terrible of all. But best of all is Phil Tayler as the simple-minded Tobias Ragg whose climactic appearance rivets our attention, our hearts and our ears–his voice rings out as clear and strong as the honest instincts his innocent character demands. The production boasts exceptional, nearly show-stealing performances by Phil Tayler as dim-witted Tobias Ragg. On the same lofty level is Phil Tayler's performance as Tobias, the dim but affectionate young man whom Mrs. Lovett takes under her wing after Sweeney's impulsive act leaves him unemployed. Tayler captures Toby's childlike spirit and trusting innocence, and conveys his intense loyalty in the heartfelt "Not While I'm Around" when the veil is lifted and his mistrust of the barber takes shape. The chemistry between Tayler and Broome is palpable and he shadows her like a loving pet, even as he tiptoes around Sweeney as if fearing a swift kick (or worse). The role of Tobias is crucial to any production of "Sweeney Todd" that aspires to greatness. The show rises and falls on a few key elements, and the song "Not While I'm Around" is one of those elements. Phil Tayler was born to play this role. I am quite familiar with Mr. Tayler's growing list of roles, and I see this as his finest work to date. From the opening number, [Phil Tayler] demands attention - a physically awkward and asymmetrical street urchin who will do anything to gain acceptance, a few pence in his pocket and a toothful of gin. Watching him absorb the madness that surrounds him and become ever more unhinged is part of the wonder of this performance. From his two-sided patter songs hawking two very different products - Pirelli's Miracle Elixir and Mrs. Lovett's Meat Pies - to his heart-breaking duet with Mrs. Lovett, this Tobias knows how to grind out his part of the story - smoothly and slowly. Special attention must be paid to Phil Tayler as the innocent Toby who slowly realizes that Todd is killing his customers. Tayler makes Toby heroic and that’s a significant change from most productions. Phil Tayler is a delight as Lovett’s simple but kindly assistant, whom he portrays with heartbreaking, childish purity. Phil Tayler, in an amusingly unhinged yet still poignant portrayal. Phil Tayler...absolutely nails the part otherwise and his rendition of “Not While I’m Around” is heartbreaking. Phil shines in this role. [Phil Tayler] also delivers one of the best numbers of the show, the touching, "Not While I'm Around". Phil Tayler is outstanding as Pierelli’s young, slow-witted employee, Tobias Ragg. Phil Tayler as Melchior in Spring Awakening. The second act is alive, alive oh: without spoiling it, let’s just say the song, "Totally Fucked," brings the house to a roar. This number features the talented Phil Tayler as Melchior. Simply put: he is wonderful. He plays a schoolboy who suffers early beatings and indifference yet uses his intelligence and his soulfulness to achieve an "awakening." It is a triumph of the spirit over adversity. Tayler is commanding as the boy at the head of the class, whose knowledge and vision tend to get him into trouble with the autocratic adults. Although he is passionate, he is also easygoing and comfortable in his own skin with the other students. When Melchior and Wendla come together, Tayler mixes softness and longing with a rising tide of desire and need, and he is both raw and intense as he descends into the depths of his character's decompensation. Phil Tayler is powerful as Melchior, employing a gorgeous voice on several solos. Phil Tayler and Melody Madarasz give astonishing performances as the innocent, anguished lovers. Phil Tayler — who has done fine work for virtually every major professional company in the Greater Boston area over the last couple of years — is Melchior, brought up in the light by progressive parents who urge him to explore his world and help inform those left in the dark — but at the risk of dooming his own future. Phil Tayler as George Milton in Of Mice and Men. Above: Phil Tayler as George Milton in John Steinbeck's Classic. Tayler brings layer after conflicted layer to his portrayal of George, creating a finely balanced performance that communicates both George’s frustration and the sustaining quality of his guardianship over Lennie. The charismatic Tayler is smart enough to make George not entirely sympathetic; sometimes bitter, even cruel, he's a smaller man than Lennie both physically and emotionally. Yet Tayler also convincingly communicates George's love for, as well as his exasperation with, his partner's simplicity; it's a remarkable, and remarkably sustained, performance - the third this year from this young actor. Phil Tayler sets the tone for the piece with his slow, methodically spoken George. Just beneath the surface there exists a cauldron of untapped emotions spanning from rage to compassion and, ultimately, great love for his friend Lennie (Harry McEnerny). The slightly built Phil Tayler, cast as George, turns the character into a pragmatist who is also a bit of a poet. Steinbeck gives the character the script’s loveliest language. Although George understands his need for Lenny (“I ain’t got any people,” he says), his willingness to nurture and protect his friend goes far beyond ordinary concern. Tayler emphasizes George’s snappishness: the character is quick to anger if he is crossed—or if Lenny is threatened. The conversational scenes between the pair, such as when George spins out the day-dream about the house with 10 acres they will buy—as soon as they have a stake—are beautifully staged. As George speaks, McEnerney’s Lenny squints off into the distance, straining to visualize this future paradise, a pose that foreshadows the tragedy of the ending. Accomplished actor Phil Tayler as George and Harry McEnerny as Lennie are riveting throughout the 2-hour,40-minute performance in the Plaza Theatre’s cozy space. Sometimes, George angrily vents his frustration with Lennie, but he’s also protective, kind, and caring towards him. Phil Tayler as Chip in On the Town. The standouts of the cast are Aimee Doherty and Phil Tayler, by now Boston's go-to duo for musical theatre...Tayler, like Doherty, was born to do musical comedy, and nails all his bits. Tayler is wonderfully sincere as naive Chip. Phil Tayler adds depth and texture to Chip...their rendition of "Come up to my Place" is memorable both visually and vocally. Yeah, but what do his peers think of him? "Phil Tayler is one of the most inventive, risk-taking, creative actors I have yet to work with. His first response is always "yes, I can do that" and his first words in rehearsal are always "what if we try this?" Whether learning choreography for Young Buddy, playing with Trekkie Monster, or even just auditioning, Phil is willing to take risks and play in a way that most young actors don't have the skill and/or courage to try. I am looking forward to directing Phil in our next project together, Marry Me a Little at the New Repertory Company." "Phil has a dedication to his art like few others I have witnessed. Aside from his immense talent, Phil is a diligent worker who takes on extremely challenging roles and executes them with finesse, professionalism, and always with a sense of fun. As a fellow actor, working with Phil has encouraged me to remember to play, take risks, and be creative." "Many acting teachers talk about theater as a giant sandbox that actors get to play in. I have rarely seen an actor who inhabits this concept as fully as Phil Tayler. His openness, his sense of play, and his commitment to his roles and his craft are truly remarkable. Phil brings an insane amount of inventiveness and energy to everything he does. His ability to entertain and connect with audiences is a true gift." Phil Tayler as Jake/et all in Stones in his Pockets. Above: Daniel Berger-Jones (Top) and Phil Tayler (Bottom) as some of the many characters in Stones in his Pockets. Without a doubt, Berger-Jones and Tayler are the reason to see this production. Watching them flip through roles in rapid pace and handle both punch lines and sorrows is like watching a master class in acting. The character changes are all about the business of acting, and, in this play, that business is very, very good. That imagination is ably illuminated by the fifteen characters played by Tayler and Berger-Jones, who display an uncanny ability to move from one role to another to yet another within two blinks of an eye. I admit that by now I have something of a man-crush (and a girl-crush too, who am I kidding?) on both these handsome thesps, who are among the most reliable actors in town. Over the past year, Tayler, who is at heart a musical-theatre man, seems to have suddenly been in everything, everywhere, after lighting up the caverns of Floyd Collins last spring. The bottom line is that the Lyric has another hit on its hands, and Tayler and Berger-Jones have earned a matched set of acting laurels. The transformations from one character to another are suggested by lightning-fast changes in costumes (a hat or scarf), dialect, facial features and physical manifestations. The effect is at first bewildering and then stunning. In the hands of a less capable Director than Courtney O'Connor or less gifted actors than Tayler and Berger-Jones, the play could be a confusing jumble. The performances were flawless and memorable. The result is something like Wedding Crashers, but with Owen Wilson and Vince Vaughn playing all the parts and crashing a film shoot instead of a wedding. Like Wilson and Vaughn, Daniel Berger-Jones and Phil Tayler make a truly dynamic duo, carrying Stones through a raucously fun first act. It's a joy to watch the two work through Jones's lively and genuine script; their comedic timing is so sharp the show seems like a choreographed dance at times. With punch lines piling high, the play continues in this fashion, only to deliver a walloping emotional blow in the act's final lines. Never has the intermission rush to the lavatory been more sedate. Tayler and Berger-Jones are so good-hearted and genuine throughout that when they finally hit on the idea of making a movie that stars cows, you might actually want to see it. 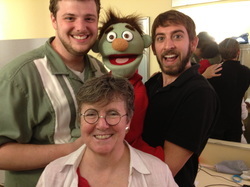 Phil Tayler as Nicky/Trekkie/et all in Avenue Q.
Phil Tayler as Nicky/Trekkie/Bad Idea Bear/Newcomer/Box. It’s hard to believe the Lyric’s four puppet handlers — John Ambrosino, Elise Arsenault, Erica Spyres, and Phil Tayler — aren’t puppet professionals; they render their charges as complex and individual as the human actors. For sheer laughs, go-for-broke energy and total puppet/human integration, Tayler wins the prize. He’s completely different, from voice to physicality, as Nicky, Trekkie Monster and the male Bad Idea Bear, disappearing into that puppet while his expressive face is always left visible to echo that character’s emotions. Tayler’s characters have mad chemistry with whomever else happens to be on stage. The stand-outs of the cast are probably the sweet, poised Erica Spyres and the versatile Phil Tayler, who as the Trekkie Monster is as incandescent here as he was in Floyd Collins just a few weeks ago. When Tayler harmonizes with other cast-members, he provides the best musical moments of the show. Avenue Q - The Lyric struck gold with their take on this millennial stage perennial. Director Spiro Veloudos had just the right comic sensibility for the material, the set was all but perfect, and the cast, anchored by Erica Spyres, John Ambrosino, and Phil Tayler, was just right. No wonder it became one of the biggest hits in this theatre's history. - Thomas Garvey, The Hub Review "Best of 2012"
Phil Tayler as Floyd Collins in Floyd Collins. Left: Phil Tayler as the title role in Floyd Collins. And Moonbox is certainly lucky in its Floyd - Phil Tayler (at left) offers both a beautifully sung and an utterly heartfelt performance...I doubt we'll see a stronger Floyd Collins in these parts anytime soon. It's notable for two major reasons - its lead, Phil Tayler, provides one of the most effortlessly charismatic performances of the year. - Thomas Garvey, The Hub Review. ...rarely have I seen such a beautiful and haunting opening as Floyd’s first exploration in the cave. Tayler’s magnetic stage presence as Floyd captivates us from the first moment he walks onstage. Every actor seems to pick up the pulse of the production and lock in when he or she inches closer to Tayler’s Floyd, and the audience savors each moment of physical contact between Floyd and others as if it was our last embrace on earth. 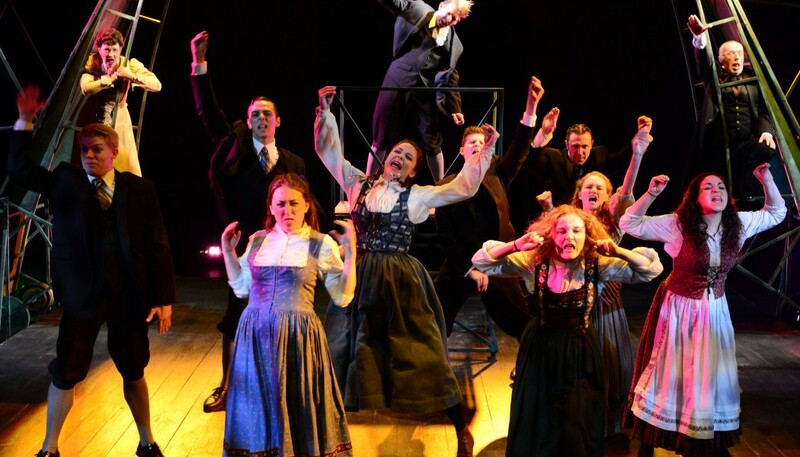 Floyd Collins - The other big news on the fringe was the rise of Moonbox Productions, which made a splash with their second production, Adam Guettel's early musical Floyd Collins. The earnest confidence and high quality of the show put Moonbox on the map, and did the same for its star, Phil Tayler (left), who demonstrated astonishing versatility across the season in productions of Avenue Q and Of Mice and Men. 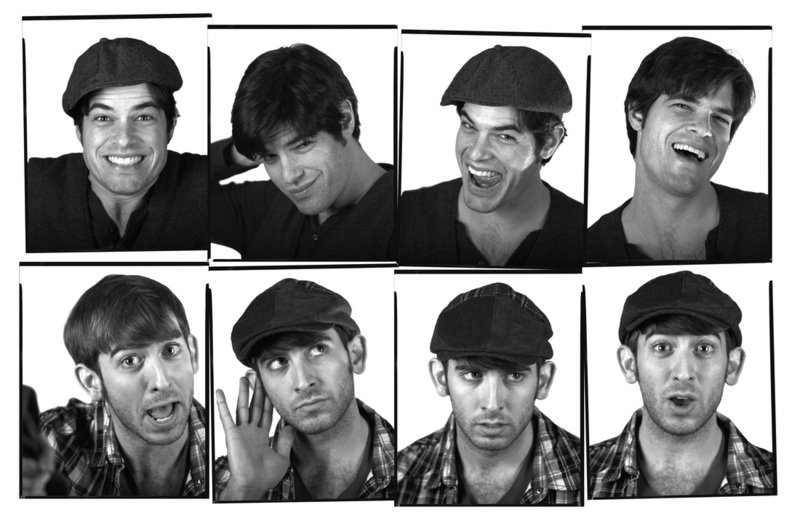 Of Mice and Men, Avenue Q, Floyd Collins, and a flashback at the 2012 season, below. Phil Tayler as Man 1 in Marry Me a Little. Above: Phil Tayler and Erica Spyres sing Little White House as Man 1 and Woman 1 in a completely re-conceived production of Marry Me a Little at the New Repertory Theatre in Watertown, MA. Phil Tayler, who now has worked opposite her [Erica Spyres] in three shows in a row, and who is also an astonishingly sincere and versatile performer. This is (if anyone's counting) the fourth riveting performance from Tayler within a year; here he almost whispers a few songs, a move that would be daring if he didn't have the kind of presence that can focus the attention of an entire house. Robbins and her cast are not hampered by the lack of a book as Sondheim's lyrics provide their own narrative and all of the singers convincingly act the stories inherent in their songs. Despite their eclectic outward appearances - from Doherty's jaded and disappointed dame to the sunnier, spirited Spyres, and from Peloquin's sexual preference-questioning neatnik to Tayler's energetic romantic - they share a common longing for connection and maintain the hope that either they'll find it someday, or maybe they're better off without it. It works, and beautifully, too. Directed and choreographed by Ilyse Robbins, the New Rep’s “Marry Me a Little’’ is an appealingly understated gem of a revue. Melancholy and uplifting by turns — but mostly melancholy; this is Sondheim we’re talking about, after all — the show underscores the necessity and difficulty of human connection, gay or straight. Phil Tayler as Tom Sawyer in Big River. Above: Phil Tayler as Tom Sawyer. [Huck's] youthful charisma is matched and even topped by the inventive and conniving Tom Sawyer played totally over the top by a not to be denied Phil Tayler. Tom’s mantra seems to be why do it the easy way when the hard way is more interesting and challenging. Phil Tayler registers vividly as Tom Sawyer. Once Tom Sawyer (Phil Tayler), Huck's best friend and partner−in−crime, enters the picture, the cast is suddenly at ease. Huck, Tom and the gang are over−the−top, and hilariously so. Jokes bounce between actors easily, and as Twain's characters meander downriver, the show gathers momentum, excitement and depth. 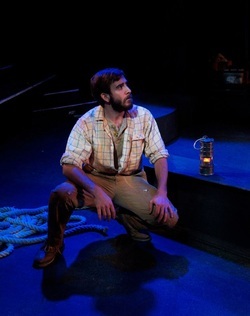 Phil Tayler’s guileless, energetic, very naïve portrayal of Tom Sawyer serves as an amusingly ironic example of how much Huck, by comparison, has matured by the end of the show. See Phil Tayler in action.